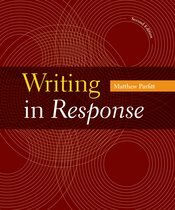 Writing in Response is a flexible, brief rhetoric that offers a unique focus on the critical practices of experienced readers, analysis and reflection, the skills at the heart of academic writing. It helps students compose academic essays by showing how active reading and exploratory writing bring fresh ideas to light and how informal response is developed into polished, documented prose. Extensively class tested, Writing in Response emphasizes the key techniques common to reading, thinking, and writing throughout the humanities and social sciences by teaching students the value of a social, incremental, and recursive writing process. The new edition includes more on working with digital tools, more help for writing, and updated readings. "Writing in Response promises to tell students what they need to know for their current writing environment--how to write for college. And then it delivers on that promise."